Qualter Hall's new Scale Lane Footbridge has recently been successfully completed and taken over by Hull City Council. This new concept competition winner is a 57 metre span, 1000 tonne, pedestrian and cycle way swing bridge, connecting Scale Lane to Tower Street on opposite banks of the River Hull. The winning entry in an international 3-stage design competition, including a public consultation, the bridge was designed, fabricated, installed and commissioned by Qualter Hall. 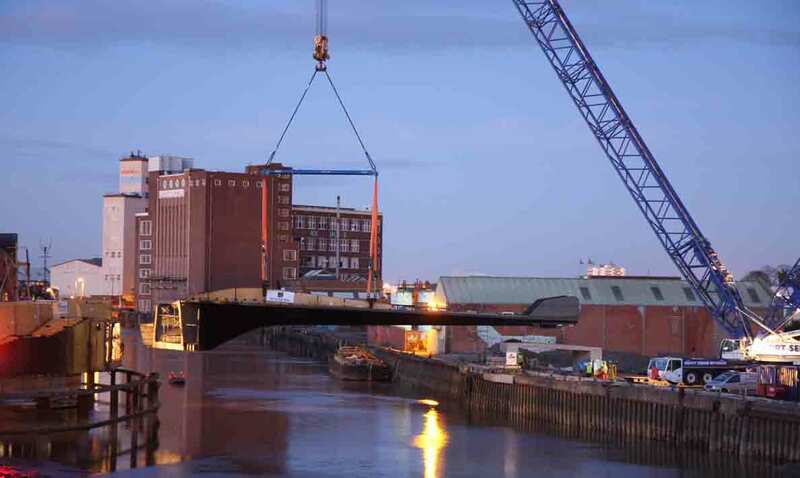 The bridge was manufactured in sections at Qualter Hall's facilities in Barnsley, transported to site, welded together on the river bank and then lifted into place across the river. 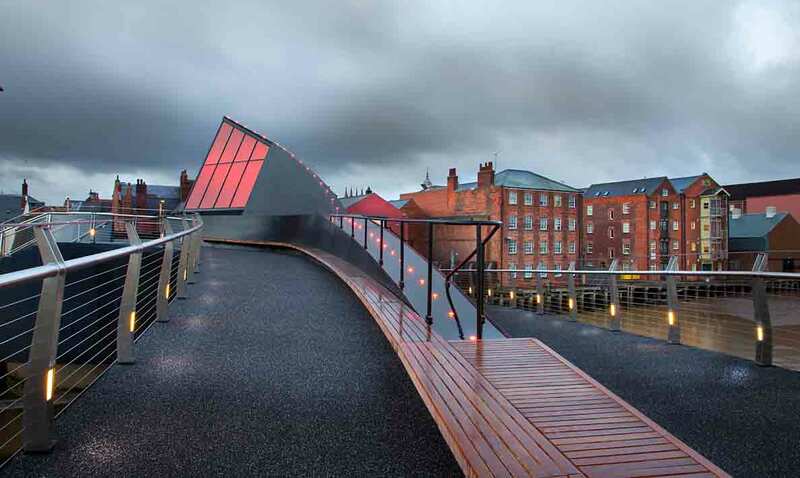 The innovative pivoting design provides the public with a unique experience as they are able to remain on the bridge while it opens and closes for river traffic, as part of the wider visitor experience - believed to be a world first. 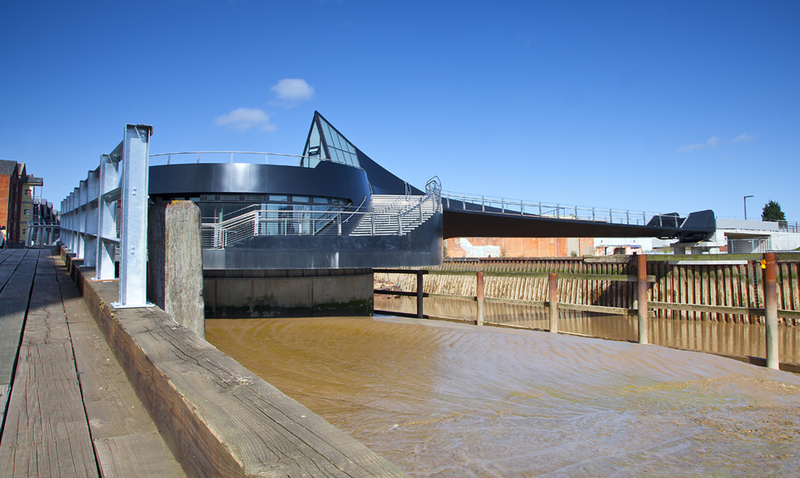 The bridge remains in permanent contact with the west bank of the River Hull, allowing pedestrians to walk and cyclists to ride on and off the bridge during rotation. The operating speed of the bridge has been set to cater for both able and disabled people to use with ease. In addition, the bridge incorporates a space with panoramic views, within the hub of the movable structure, suitable for a bistro/restaurant. The scheme also includes a new landscaped garden and square, lighting system, integrated public artwork and sound system. The black steel bridge has a distinctive robust character and curving form, making it a memorable landmark that is unique to Hull and its industrial and maritime heritage. The primary structure consists of a steel spine, cantilevering approximately 37 metres from a three-dimensional Vierendeel girder ring that is approximately 15 metres in diameter, with a circular structure which houses the glazed bistro/restaurant space. 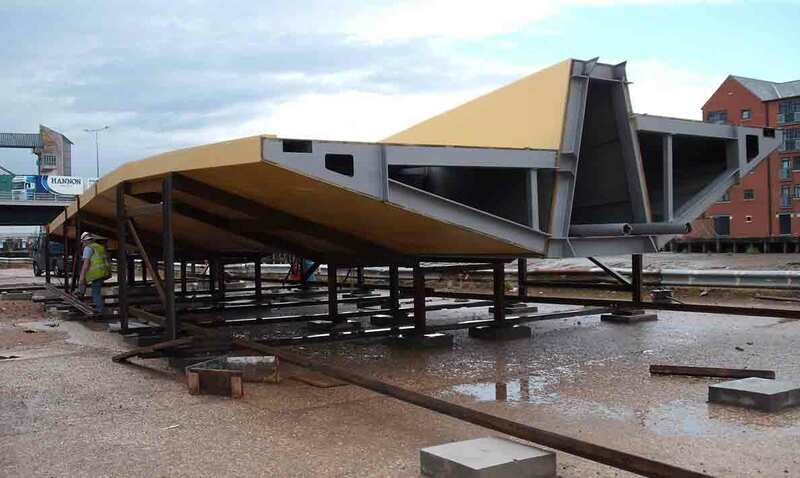 The structure is supported on wheels and incorporates a slew bearing to permit rotation, which is then supported on a tubular pile/concrete substructure. A 650 tonne concrete ballast located in the hub and walkways provides a counterbalance to the 37 metre long spine section. A cantilevered steel spine arches up and over the river, allowing enough room for smaller boats to pass under without need to operate the bridge, and it rotates using an electrical drive mechanism to open the route to river traffic when large vessels need to pass. The bridge's sweeping form creates two generous pedestrian routes, one gently sloping and a shorter stepped walkway. 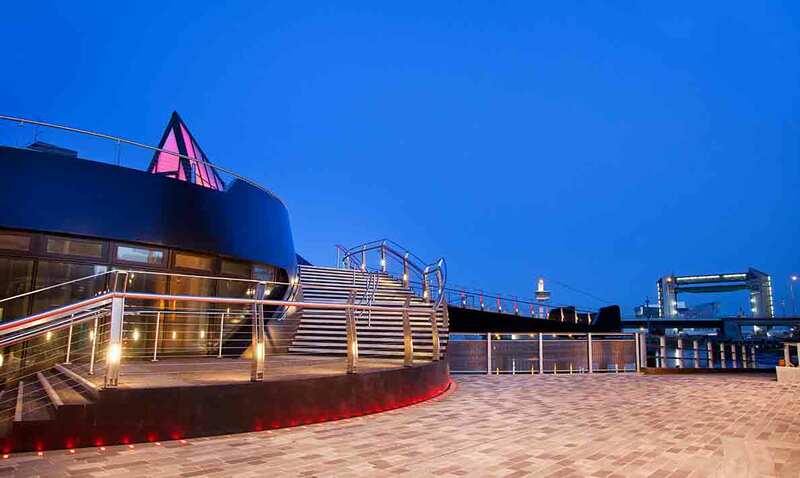 The roof of the drum provides an upper viewing deck with a seamless steel balustrade, which gives the feeling of being on board a docked ocean liner. Seating areas are included on the central structural spine of the bridge, creating a variety of places for people to pause on route to relax and enjoy the riverscape views. The spine rises into a back-lit rooflight which provides a marker for the bridge at night. 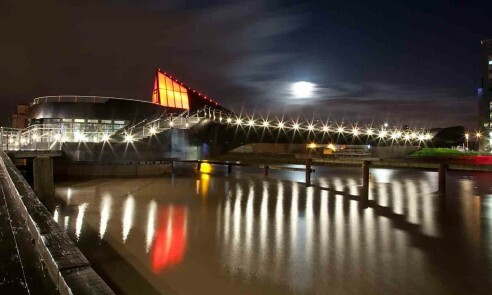 The public artwork on the bridge provides a sonic landscape in which to enjoy the riverscape. When the bridge opening is activated a new sequence of rhythmic bells is triggered which increases in urgency and combines with a pulsing light. This has a practical purpose in alerting pedestrians to the imminent opening rotation, and it heightens the drama of the 'ride'. At night, low level fluorescents integrated into the parapet posts light the profile of the bridge and bring colour and sparkle to the blackened industrial riverscape. Located in Kingston upon Hull, east of Hull city centre, the bridge connects Hull's Old Town Conservation Area to the undeveloped industrial landscape of the East Bank, helping to unlock the potential of the riverside and promote wider regeneration in the areas east of the city centre. Scale Lane Staith on the West Bank has been re-landscaped with a series of stepped gardens leading to a new public square at the threshold of the bridge. 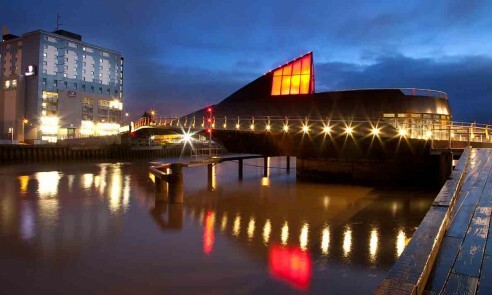 The bridge provides a walkable route connecting the Museums Quarter on the West Bank to Hull's major attraction The Deep. Hull City Council is now actively seeking a tenant to occupy the restaurant space in the bridge hub. Once in place, Scale Lane Bridge will become a lively animated public place at all times of the day, fulfilling the design team's intention to create more than just a crossing but a destination in its own right. "The opening of this bridge gives the city an excellent opportunity to connect the East Bank of the river to the city centre creating opportunities for new economic development. It is great that we have been able to work with our partners to create a bridge that is not only useful to local residents and visitors to the city but is also such a fantastic design." Span: - 57m, with 37m cantilever, 30m clear opening. The structure consists of a steel spine cantilevering around from a 3-dimensional braced ring structure approximately 15m in diameter. The spine is a hybrid structure with the 'root' section conceived as a diagrid/shell structure and the tip as a shell structure. Steel plates clad the surface of the walkways whilst horizontal bracing provides additional longitudinal stiffness. The ring/drum/hub structure consists of columns connected to horizontal steel "wheel" structures forming both levels of the 3D ring. The circular hub section acts as a counterbalance to the cantilever section, with heavy RC slabs at both levels of the 3D ring structure. Braced frames provide stability of the ring structure. 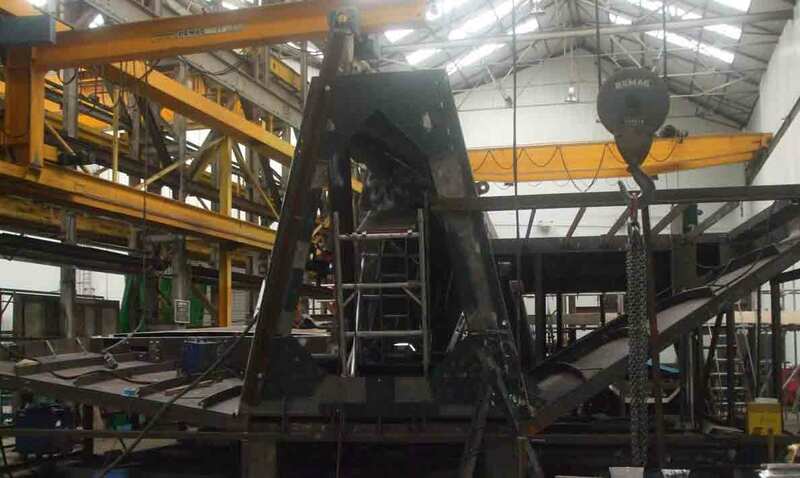 The bridge hub is supported vertically on a central pintle and six single/four double wheel assemblies running on a 15m diameter flat circular track, like a railway turntable, secured to a concrete drum supported on ten 1.6m diameter piles over 30m long. Three electric bevel gear units drive the bridge which pivots around a central slew bearing. The bridge is operated from a radio pendant, with the whole sequence taking around 2 minutes. The bridge operator closes a gate at the East Bank triggering the opening of the bridge. There are no barriers at the West Bank so people can freely walk on and off while it is in motion. The speed of rotation at that edge is slow - less than 0.15m/sec, (less than half the speed of the London Eye) so can be stepped across safely. Integrated public artwork is included on the site of the bridge. Bronze strips measure out the space and incorporate the sparkle of back-lit text naming the parts of an historical merchant ship. Speakers concealed in the bridge seating and throughout the West Bank play a range of sounds including bird songs, creating a gentle and varying spatial soundscape. When the bridge is due to open the light and sound installation switches to an opening sequence to signal the rotation. 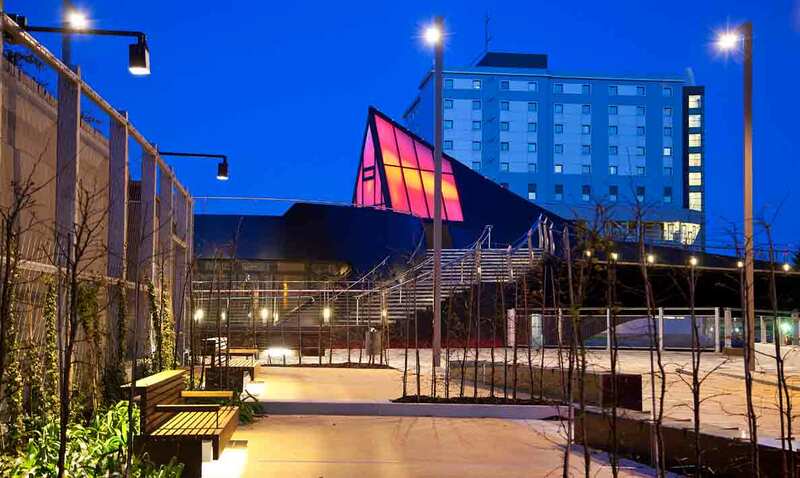 Rhythmic bells and a pulsing light, emanating from the roof light fin and LED lights embedded in the bridge path, serve to alert pedestrians to the imminent opening without recourse to a conventional 'keep off' hazard light and sound warning system. The activity climaxes at the moment the movement begins, continues during the movement cycle and subsides as it comes to a stop. The lighting provides functional and energy efficient illumination of the deck of the bridge by specially designed small fittings that are integrated within the balustrade. These fittings were designed to deliberately allow a little light out over the water so at night the shape of the bridge is defined by the points of light from the line of fittings. On the fin of the bridge the design includes tiny points of light that emphasise the shape and which come on when the bridge moves. Around the joint between the bank and the bridge is a row of recessed lights which also spring into life when the bridge moves. The lighting adds to the drama when this extraordinary structure moves. The West Bank of the bridge, which leads to the Old Town and is part of the Old Town Conservation Area, has been re-landscaped. A car park along Scale Lane Staith has been replaced with a series of informal 'garden rooms' stepping up to the river side (with its increased flood defence level) and leading to a new paved square which will eventually provide space for alfresco seating for the restaurant. The original cobbles of the original staith have been retained and re-laid. A green wall of planting will provide a cohesive edge and screen the adjacent building once it matures. On the East Bank, pending further redevelopment of the riverside site, a temporary ramped path has been laid which orientates pedestrians to Hull's main visitor attraction The Deep.